What is Kefir? Why is it a wonderful health food? Today I made a trip to Starfruit Cafe, a local frozen kefir chain in Chicago. It’s my favorite frozen treat place, I am pretty much a regular and they know me by name there haha, that’s how often I go there. The only reason is because I love love love kefir. Frozen kefir especially. It tastes like frozen yogurt but is so much healthier. I consider frozen kefir a meal, because of how nutritious it is and high in protein, while I consider frozen yogurt a dessert because it is usually higher in sugar and much lower in protein. I like kefir so much I even did an advertising project on Starfruit Cafe last semester which allowed me to learn quite a bit about kefir’s benefits. And there are many! So what are those wonderful properties of kefir, you might ask? Well, let’s do a quick overview! So what is kefir? Kefir is a bubbly drink which has been fermented with kefir grains. It has been discovered by ancient shepherds who accidentally realized that carrying fresh milk in leather pouches turned it into a bubbly beverage. My favorite kefir brand, Lifeway. Kefir contains 10 live probiotic cultures (yogurt usually have only 2-3). These healthy bacteria are the reason why kefir is considered healthier than yogurt. It is delicious and comes in a large variety of flavors and types. Good source of protein, calcium, potassium. It’s a brain-food and helps break free from stress. It has been used to help patients with cancer, AIDS, ADHD, depression. Nourishes your hair, treats gum diseases and strengthens your bones. Sources: Kefir.net, Starfruit Cafe, Wikipedia, LA Times, Be Well Buzz. Have you ever tried kefir? 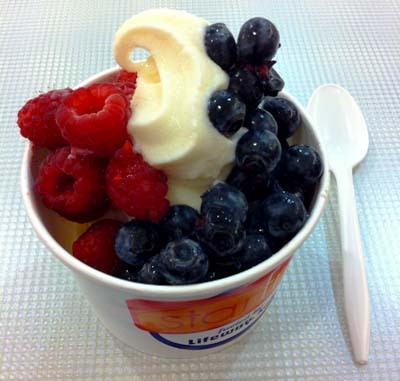 What is your favorite flavor of kefir or yogurt? Thanks for taking the time to do all this work on the web – I am so happy I found your blog. early in the break of day, because i love to learn more and more.